Romanian Prime Minister Victor Ponta leaves the government headquarters after announcing his resignation in Bucharest, Romania November 4, 2015. Romania's Prime Minister Victor Ponta says his government is resigning in response to protests demanding he and other top officials step down after a nightclub fire resulted in 32 deaths last week. 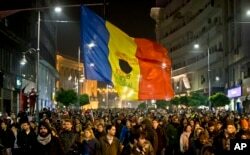 The prime minister released his statement early Wednesday, saying he hopes his response will satisfy the thousands of protesters who marched through central Bucharest Tuesday. The protesters allege several senior officials allowed themselves to be bribed in exchange for permits to put on shows in crowded and unsafe clubs. Thirty-two young concert-goers died Friday night and 200 others were badly injured, after fireworks set off during a show at the Colectiv nightclub ignited the ceiling and caused a stampede of some 400 people toward the only exit. Waving banners reading "Corruption Kills," the protesters demanded the resignations of Prime Minister Ponta, deputy Gabriel Oprea, and the mayor of the Bucharest district, where the club was located.